Sergeant Lester Ferris is a man with a duty to fulfill. He has been assigned to keep the peace on behalf of Britain on the island of Mancreu. The island itself is doomed. It has been emitting dangerous chemicals and the leadership of the world has decreed that it should be destroyed. Bit by bit, the island falls apart and its inhabitants leave for a safer place. While he is only concerned with keeping the peace in general, he becomes very invested in the well-being of one teen boy. As the island descends into chaos, Lester will do anything to keep the boy safe and to prove to himself just what kind of person he is. 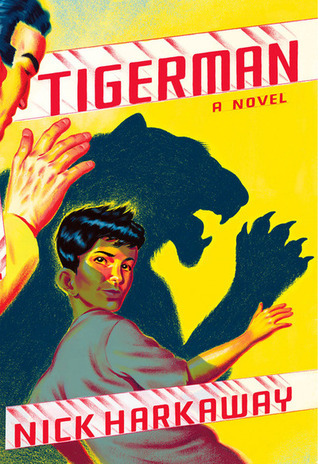 Tigerman is incredibly different from Harkaway's previous book Angelmaker. While this takes a while to get used to, it is a testament to his skill as a writer. Angelmaker was nonstop action while Tigerman has sections of page-turning craziness and moments of quiet insight. Lester is looking forward to retirement in his future and he is contemplating his life - the things he has done, the things he would like to do, and what he has to show for all of his years. The adventure is irresistible. This is the story of an island with dark undercurrents - nearly every nation of the world has a vested interest and it is impossible to tell who is loyal to whom. When Lester's friend is murdered, his quest to find the murderer reveals long-held secrets about the people on the island he thought he knew. The boy convinces him that the best way to fight the evil that is overtaking Mancreu is to put on a mask and become a hero, just like the ones in his beloved comic books. Lester hesitantly takes up the mantle of Tigerman, a hero cobbled together from his weapons collection and the creativity of the boy. Tigerman faces angry mobs and bursts into strongholds full of drugs and armed guards. But the heart of this novel is the relationships, between Lester and the boy, between Lester and the other officials on the island, and between the island's residents. Lester Ferris is a character you can't help but love. He is awkward and unsure of his duty as a sergeant and what he should do as a person who can't ignore what is going on in front of him. This is a book I am still thinking about long after finishing it. The characters and locale are so painstakingly built that a reader might wish for a whole series set on the fascinating but doomed island of Mancreu. Nick Harkaway is talented, smart, and always manages to take things you thought you knew and make them new all over again. If you haven't experienced his thoughtful and engaging writing and unforgettable characters yet, you are missing out. I have yet to read Harkaway, but every time I see a good review he moves a notch higher on the TBR list. He is one of my favorite authors. He's brilliant and such a lot of fun. I think you would enjoy his books!